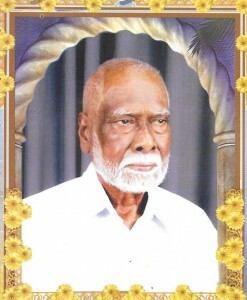 Mr. P. Santhirasekari (பொ. சந்திரசேகரி, Ponnampalam Santhirasekari) led a life of ‘KARMAYOGA’. He became a teacher at Periyakulam and made his mark by his efficiency. He bought up 10 children empowered them and stood them worthy in the society. He was not just an executive of the teacher’s Union but a person who continuously laboured to raise it to higher level. He gave strength to the agricultural cooperative society of Nedunkulam. He was a political force who could compel the elected leaders. He was an ever available social counselor. In rendering help he was unselfish. The Tamil culture ‘VIRUNTHOMPAL’ embedded in the Holy Thirukkural was a norm at his home such that for all people known to him his house was a transit lounge. He lived for Tamil community in his own right. He was a friend philosopher and guide to me and many. Perhaps the most recognized senior citizen of my time, he was called and referred to as சந்திரசேகரி ஐயா or simply ஐயா by one and all. He life is an example for others to live their life usefully. தமிழுக்காய் வெண்கலக் குரல் ஒலித்திட தன்னலம் கருதாது வாழ்ந்த தலைவன். துறந்தார் தம் உடலை நாம் துன்புறவே !! அவர் வாழ்வோ யாவர்க்கும் வழிகாட்டி !! !